The most practical way to get dinner on the table fast is to check your shelves for specific products that have online recipes: Campbell's soup, Velveeta, RO*TEL, Pillsbury crescent rolls. Again, keep an open mind and think outside the recipe box a bit, subbing when necessary. For example, if you have refrigerated roll dough, check Pillsbury.com for ideas. Find one of your go-to ingredients and build a quick meal around it. My go-to family dinner is pasta, a cream-based Alfredo-like sauce, chicken or shrimp and some veggies all tossed together. Chances are you will always have the bare bones of your go-to family dinner hanging around, whatever it may be. Here's a quick recipe for tonight's dinner! The verdict from my husband: "Yogurt, really? It was good!" While pasta is cooking, toss vegetables with olive oil, salt and pepper and spread on a lined baking sheet. Cook at 425 degrees F for 25 minutes. Once pasta is cooked, drain and return to the pot. Add yogurt and bruschetta spread and mix thoroughly. Add cheeses and stir. Top with roasted vegetables or serve alongside. Add a meat: I had a prepared chicken breast on-hand, or you could season and bake one at 350 degrees F for 30 minutes. Swap your cheeses: Any shredded cheese could work here so use what you have in the fridge. Get some green: After dishing this up, I realized it would have been great with some chopped spinach wilted into the sauce. Think in general terms, not specifics: If your recipe calls for cream, consider swapping in plain yogurt, sour cream or even whole milk. You may have to adjust the amounts to avoid things being too soupy or too sticky. Pick a protein: The protein will usually dictate the direction of your meal so see what's on hand and don't count out breakfast and lunch fare like lunch meat, eggs and sausage. 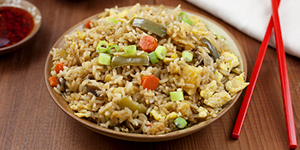 If you have eggs but you're not feeling breakfasty, how about fried rice? Use sausage on pizzas and pastas. Lunch meat makes great pocket dishes. Serve a salad: If your family eats their greens, make a massive salad for supper. Or, let the kids have some fun and keep all the salad fixings in separate bowls and let them mix and match like a salad bar. Bulk it up by adding some cooked pasta, tortellini or leftover meats.